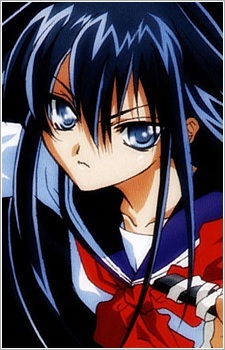 Hazuki is a very tall, quiet and serious girl, with long dark blue hair and sharp blue eyes. She uses the relatively masculine first person pronoun “boku”. She appears to be very popular among girls, with admirers developing crushes on her on many occasions both in school and in several book worlds. Hazuki is cold and unfriendly, but not particularly rude (e.g. throwing away the gift that a female admirer gave her as soon as the girl went out of sight). She is deeply in love and is fiercely protective of Hatsumi, and fended off boys trying to approach to the girl.